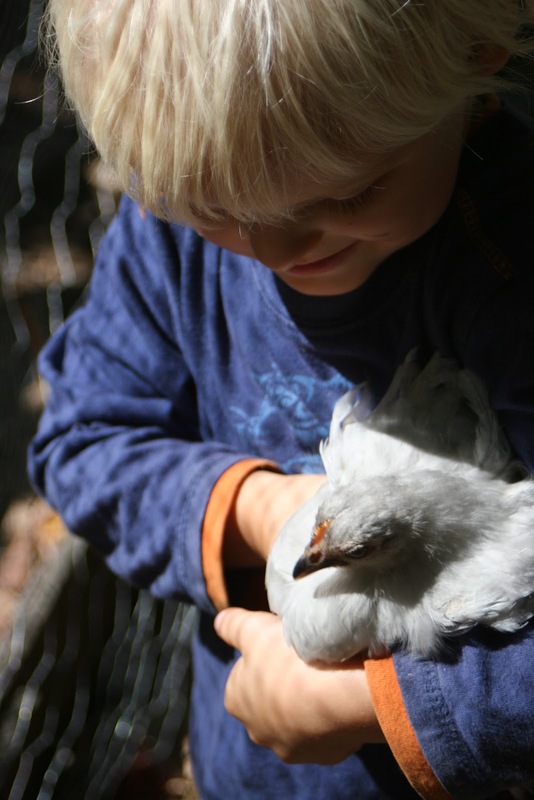 I took my four-year-old to a poultry auction on the weekend to buy some new chooks for our henhouse. He has a natural affinity with animals, this boy, and I often find him wandering around the garden with a gecko cradled in his hands. Some days I wake from a nap with my baby and find him missing from the house. He is invariably down at the henhouse, his second home, where he is thinking of sleeping now that he has a new chicken to love. Her name is Lemony - because she is a lemon chicken, or at least close to the colour of one. 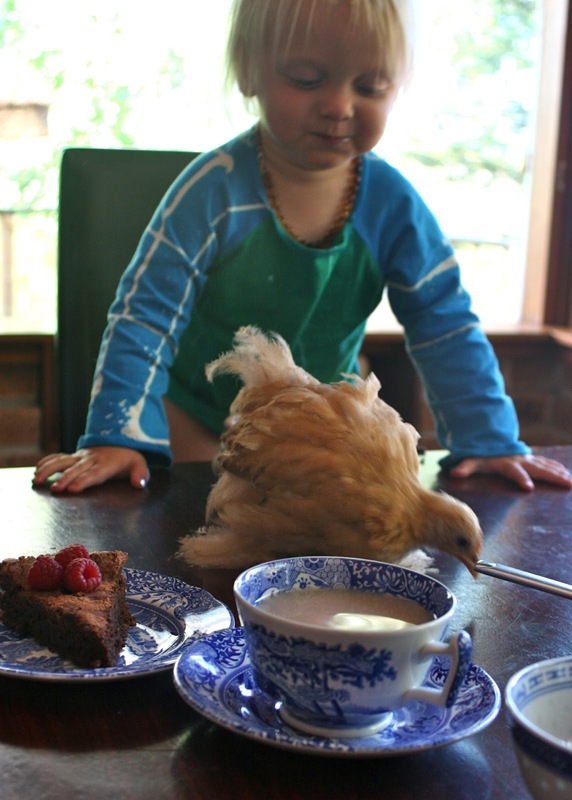 She has already joined us for breakfast and a birthday tea party at the dining table and likes to perch of the side of his bowl to share his cereal or cake crumbs. Lemony is a seven-week-old Pekin pullet. We also have a mother hen and her little girl chick, Crown and Blueberry, both Pekins. But Crown saves all her mother love for Blueberry and little Lemony gets pecked if she gets in their way. Two Araucanas, with faces only their mothers could love, complete our new flock. 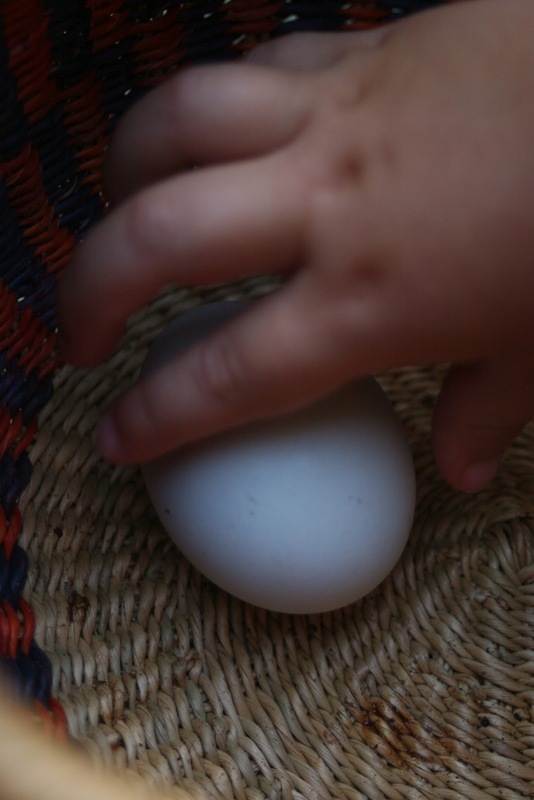 Madame Pompadour and Bluebeard are already laying and leave one shiny new blue egg nestled in the straw for Darcy to collect each day. It has been a month since our old girls were taken and it is so good to see life in the garden again. I felt bereft after losing our chooks. 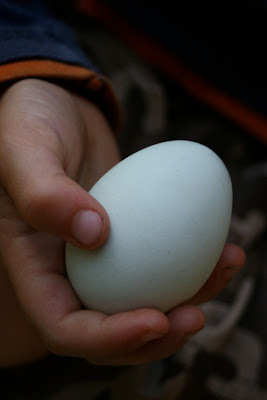 I love them for the eggs and manure they provide in exchange for the scrapings from our plates, for the life they bring to the garden and the soil, but most of all for their company. With the hen house empty I found few reasons worth wandering down the hill into the garden, which grew parched and dry and neglected. The worm farm groaned under the weight of kitchen scraps. But since our new girls have settled in I have been busy raking up dry leaves and making compost, harvesting vegetables and planting new seedlings. I have even watered the lawn, after more than a month without rain. And we are eating eggs again. 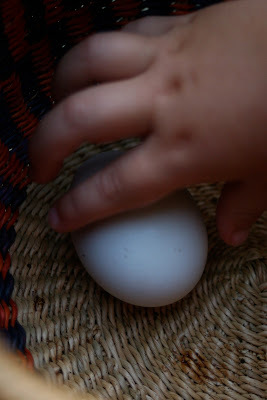 Eggs from the farm, after a visit from Nana. Eggs from a neighbour, laid with love. And blue eggs, once we have collected enough for an omlette.